The Imagineering Company is named well. These guys have great imaginations when it comes to games. They sent me a fun-filled drawing game called “Whatchmedrawit”. When I first heard about this one I was a bit intrigued. The instructions are simple. You have a couple options. Draw for your own fun or Draw to win. It is fun to use your imagination to try and draw the crazy descriptions on the game cards. When you draw to win several of you and your friends draw your version of the words depicted on the card. Then a predetermined judge decides who did the best job. See all the creative ways the cards are drawn. I had a blast just doing some of the cards on my own. Fun for one or a crowd. This isn’t a game that makes you draw inside the lines or asks you to draw pictures of things that exist in the real world. Big yawn. This is creativity gone wacky. Drawing gone wild. Fun gone crazy. 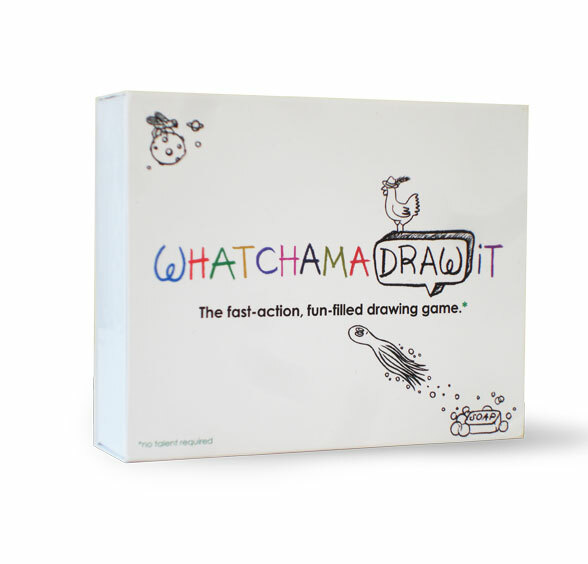 WhatchamaDRAWit is as much fun to say as it is to play.WhatchamaDRAWit is fun for one…or one hundred. All you need is paper, pens and your imagination…no talent required. 110 WhatchamaDRAWit cards with outrageous concoctions to imagine and draw (plus 1 How To Play card). 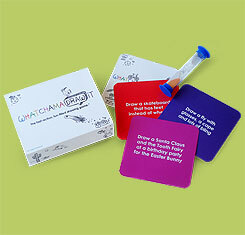 Pick a card, turn over the timer and draw–just for fun or to win. Want to keep up with all things The Imagineering Company? You can like em on Facebook. Ready to buy? Head on over to The Imagineering Company and get ya some of these innovative products. I love cookies, but who needs the guilt. 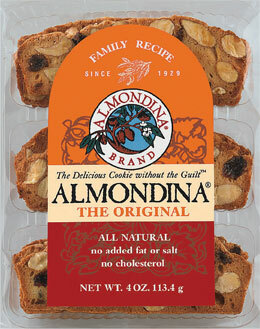 Almondina has the most delicious crispy guilt free cookies around. 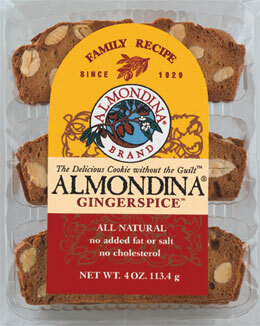 The nice folks over at Almondina sent over several varieties of their fabulous biscuits for us to review. Let’s check em out. So wishing Grandma Dina was part of our family. 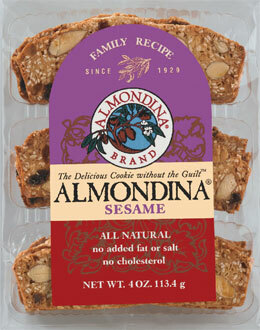 Excellent flavored thin sliced crunchy cookie with a generous portion of sliced almonds. Raisins give it a slightly sticky texture. The delicious cookie without the guilt™ – this is the cookie that made us famous and it is still our #1 bestseller. Based on Grandma Dina’s original secret recipe that she called Petit Gateau Sec, we begin with top quality almonds, plump raisins, and a blend of other natural flavors, then cook this to a perfect crispness. Delicious. Crunchy. All-natural. No Cholesterol. Alright somebody better bring me some coffee. 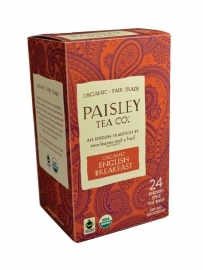 This is the perfect addition to your morning Joe. Nutty chocolatey and crunchy. What for could you ask for. The finest chocolate in a delicious crunchy cookie. If you are a chocolate lover, then this is the cookie for you! 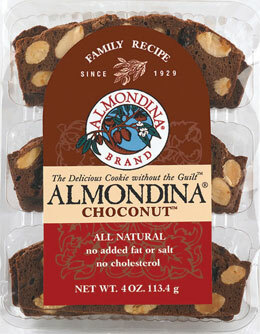 We took the Almondina cookie recipe and added some of the world’s best chocolate. The result is a delicious, chocolaty, crunchy cookie that is still low in calories. No wonder it is a bestseller. Delicious. Crunchy. All-natural. No Cholesterol. Indulge! Excellent. Perfect amount of cinnamon. Almonds come through really well. Delightful. The Cinn-full Treat™ – The Original for cinnamon lovers. 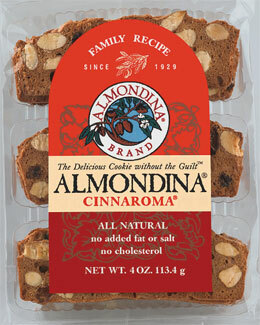 Almonds, raisins, and cinnamon just seem to be made to go together – so we combined them in our Cinnaroma cookie. These make a wonderful snack, but we like them best on a Sunday morning with tea of coffee. Delicious. Crunchy. All-natural. No Cholesterol. Real ginger pieces rock this cookie. Not overpowering, but let’s ya know it’s there. Very nice. Undoubtedly my favorite. Dark crispy and delicious. 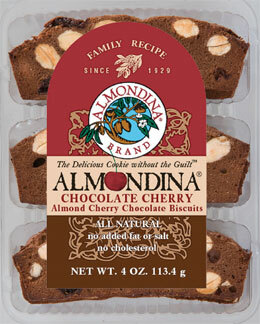 Perfect blend of chocolate, cherry and almond goodness. Love em. For chocolate lovers everywhere. We combined the world’s best dark chocolate with plump cherries to produce an irresistible, decadent treat without guilt. Delicious. Crunchy. All-Natural. No Cholesterol. Indulge! 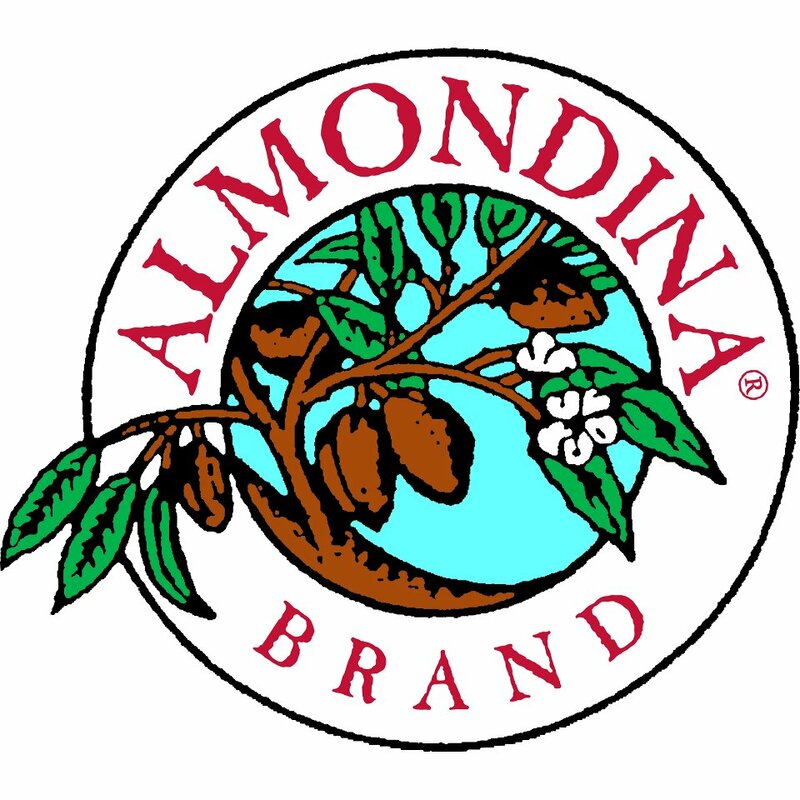 Want to keep up with all things Almondina? You can like em on Facebook and follow em on Twitter. Ready to buy? Head on over to Almondina and get ya some of these delicious biscuits. I love riding horses. There is nothing like riding on the back of one of these majestic animals. The sound of hooves pounding, the feel of the raw power as the wind rushes by. Simply incredible. With the power and speed comes a need for safety. That is where Troxel Equestrian Helmets come in. They sent me over one of their all-new Venture helmets for review. Let’s check it out. Available in two colors and three sizes the Venture is stylish all the way around. Light weight yet extremely sturdy Very well made. This is the helmet you are looking for. Perfect for those who are into training/ schooling, eventing, timed events, trail riding etc… Fits perfectly with Cinch Fit. No rubbing or sliding. Not overly hot to wear either. With the moisture wicking removable washable headliner with Air-Channel Technology you aren’t going to overheat. The Venture is styled with a modern, athletic look and incorporates a range of comfort and fit technologies. With an open cell foam and moisture wicking Drilex® headliner, the Venture ensures an unmatched level of comfort and fit. The styling includes premium leather, reflective piping, and a breathable honeycomb mesh, concealing Troxel’s air-channeling cluster vents. Want to learn more about the Troxel Cinch Fit System? 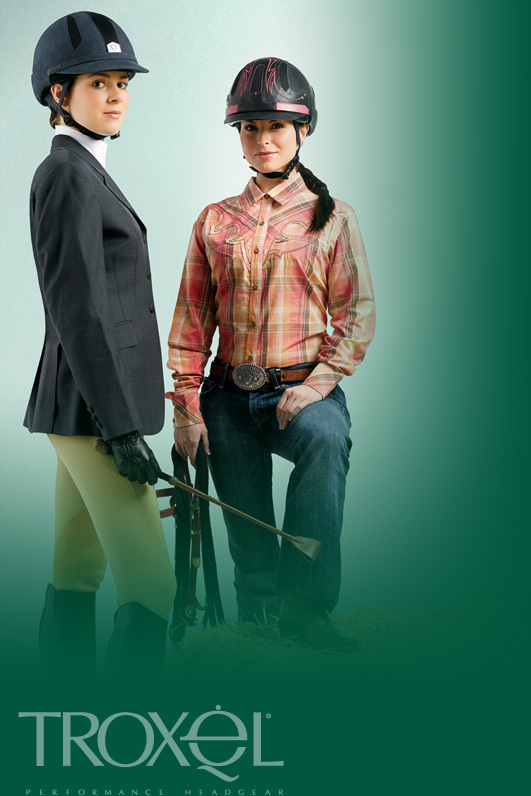 If you are not sure which helmet is right for you be sure to check out Troxel’s Helmet Advisor. Want to keep up with all things Troxel Performance Headgear? You can like em on Facebook and follow em on Twitter. Ready to buy? 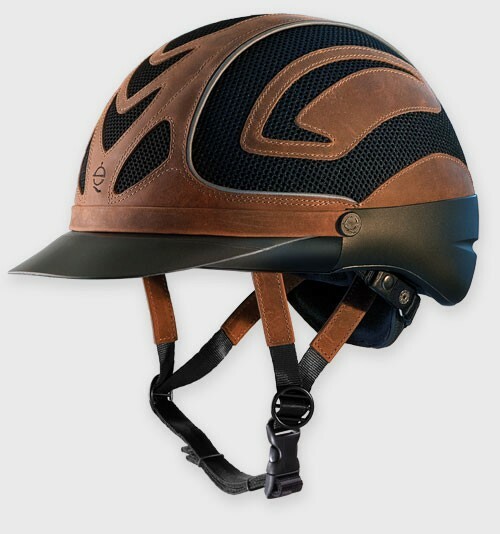 Head on over to Troxel Performance Headgear and get ya some of these great equestrian helmets.